Support at parity? NOPE! For the gazillionth time in a row, AUD/USD gave me another heartbreak, and this time it even added a well-deserved slap in my face. That will teach me not to be too confident on my setups! Almost right after my order at 1.0000 (parity) got triggered, AUD/USD fell sharply in the charts and hit my tight stop loss at .9950. As it turned out, no amount of technical support could make the Aussie bulls attack when fears over the euro zone debt crisis and the disappointing FOMC statement are dominating risk sentiment. Thanks and looking forward to your advice! Could it be? I finally caught a move from parity. Is this my chance to profit from the Aussie? If you liked that short rhyme, you also might like my swing trade setup! Thanks to the Fed‘s announcement of “Operation Twist”, the Greenback rallied just enough to trigger my entry order for AUD/USD. It seemed that the markets were relieved to find out that the U.S. central bank wasn’t gonna implement QE3, even though there were plenty of doubts that “Operation Twist” would be enough to save the U.S. economy. With that, I’m thinking that the strong dollar-buying that we saw yesterday was merely a knee-jerk reaction to the news. If that’s the case, AUD/USD could recoup its losses from yesterday and climb back up to the 1.0200 former support level. That’s where I set my first profit target. For my second profit target, I’m planning to aim for the 1.0400 level. I know it’s pretty ambitious, but that’d be just enough to close the gap we saw over the weekend. All gaps gotta close, right? Once my first target is hit, I’ll be moving my stop to breakeven in order to protect my profits. Also, I’ll be keeping close tabs on the upcoming U.S. and Australian economic data to see if I should exit early or keep holding on. Long AUD/USD at 1.0000, initial stop loss at .9950, pt1 at 1.0200, pt2 at 1.0400. I risked 0.5% of my account on this trade. I don’t know which is more frustrating, this losing day trade or Steve Carell being unable to bag the Outstanding Lead Actor Award in a Comedy Series during the 2011 Emmys. It’s his last season in The Office, for crying out loud! As I always say, there’s no use crying over spilled milk. I guess this loss serves as a reminder that I should be more patient and not make any hasty decisions. With that, I’m still sticking to my original AUD/USD swing trade idea at parity. 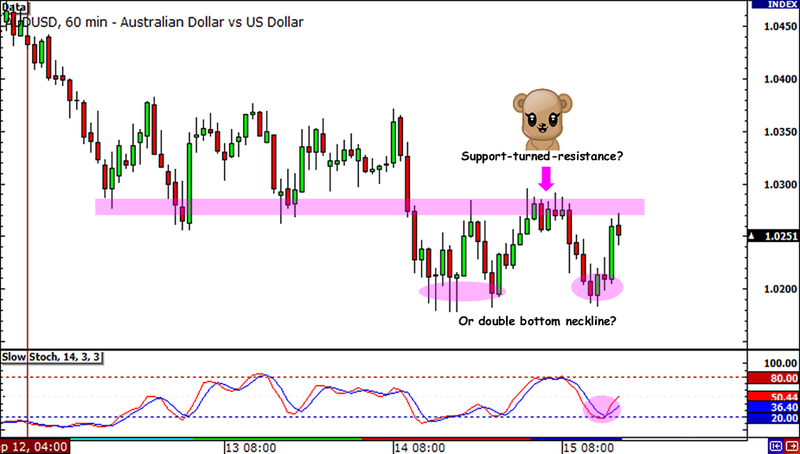 If you’ve been dropping by my Comdoll Corners, you’d know that SimonTemplar, one of my Best Forex Friends, is also waiting on the very same trade opportunity. 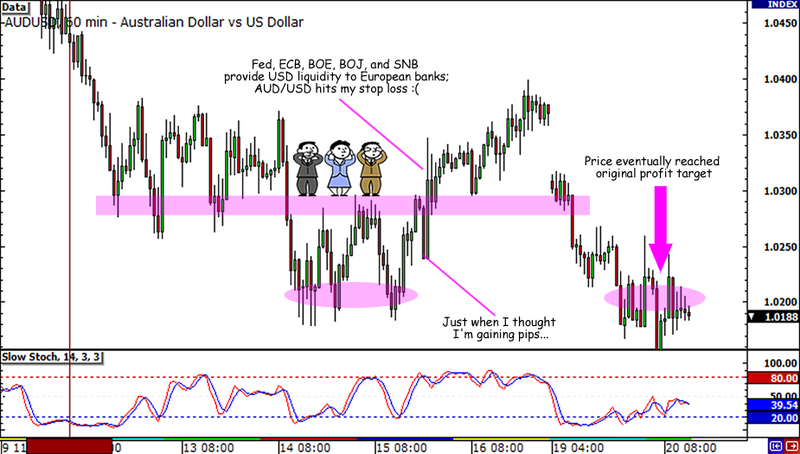 Hey, why don’t you come and join our discussion in the AUD/USD thread? I’d love to hear what you think! For the scalpers and day traders out there who can’t wait for AUD/USD to reach parity, here’s a shorter-term setup I’m planning to take. 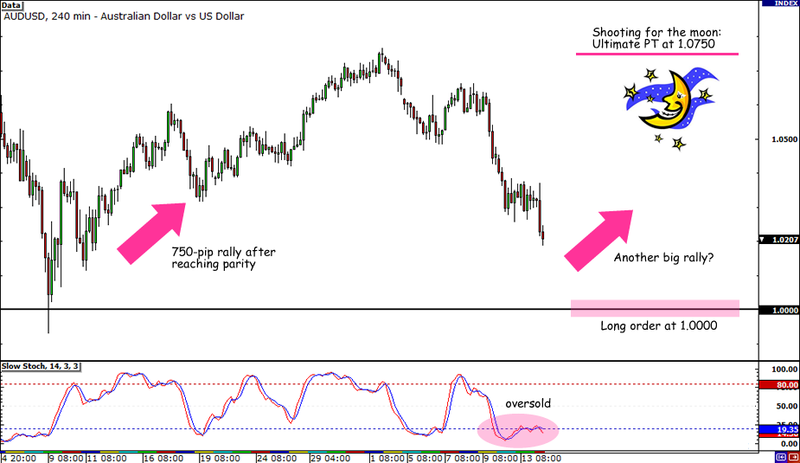 Do you think I could catch pips with this AUD/USD short and ride it down to parity? 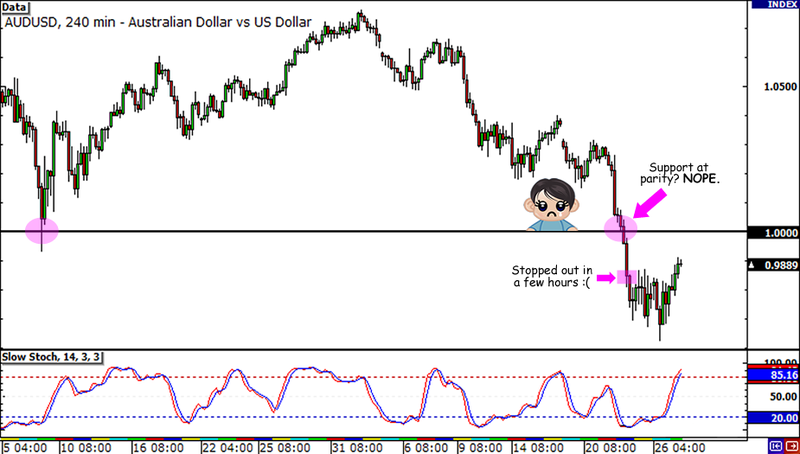 AUD/USD seems to be moving sideways lately and support at 1.0200 has been as stubborn as my 4-year old nephew. There’s resistance at the day open price (1.0267), which is in line with a former support level, and now I’m thinking of shorting there. I’ll be aiming for the bottom of the range only, right at the 1.0200 handle or I’ll be closing my trade before the end of the day. Thanks to my BFF @EnkhbatOne by the way, who pointed out that I should also watch for a possible double bottom break on my setup. Now I know that I have to be extra careful on this trade! On the fundamental side, economic data from Australia has been a bit upbeat recently, with the Westpac consumer sentiment index printing a 8.1% increase and MI inflation expectations up a notch to 2.8% for August. However, the downtrend on AUD/USD remains strong since risk aversion is the dominant theme in the markets. Just yesterday, traders bought up the safe-havens when the U.S. showed weak retail sales and PPI figures, and we could see more of that when they release their CPI and manufacturing indices. So who’s with me on this intraday trade idea? Do you spot any adjustments that I need to make? I know a bunch of you advised me to short this pair until it reaches parity so I should be seeing some hands raised! All right, it’s time to take another shot at trading the Aussie! After ending my losing AUD trades with a break even last time, will I finally score a win this time? AUD/USD already went down by 225 pips for the week, so I figured it could reach parity especially if the euro zone debt crisis continues to make headlines. If it does, then there’s a good chance that the worst case scenario is already priced in and the high-yielding currencies will be supported by some bargain hunters. If you remember, the last time AUD/USD touched parity was in August 9, just before the FOMC announced its decision to keep rates uber low until mid-2013. If only I had taken that support-at-parity trade, I would’ve gained at least 750 pips on a swing trade! 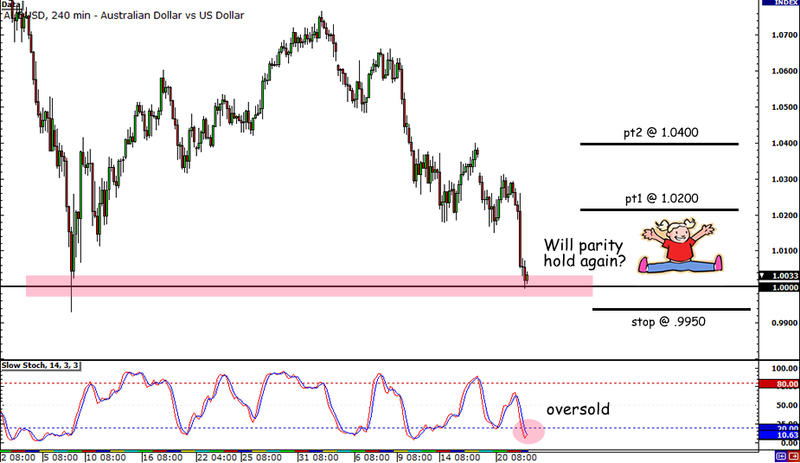 This time I’m looking to buy the Aussie at parity especially if stochastic moves above the oversold region. I’m planning to place my stop at .9920, which is near August 9’s low. If my trade gets lucky and the pair bounces off support, I’m planning to adjust my stop and add positions every 100 pips. Of course, I have to keep a close eye on news reports too. Right now markets are still jittery on buying high-yielding currencies, but based on the news that the euro zone, U.S., and even the BRIC leaders are willing to help the euro region, I’m thinking that risk aversion might be priced in already and start to support the comdolls soon.